This is a C6-5 C-class single stage model rocket engine designed to launch model rockets. Retail $11.79 SAVE 23% ! This is a good 18mm engine. It is quite powerful, and I love the long burn time, and the jump off the pad it gives lighter rockets. It&apos;ll get an Alpha or similar rocket way up there! The only problem is that sometimes it is too powerful, and I have lost 1 rocket, and had 3 or 4 rockets damaged as a result of not so perfect recoveries. 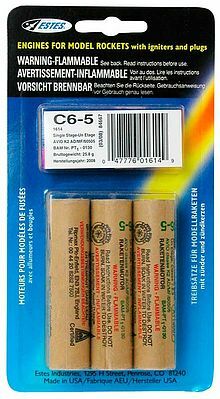 C-class model rocket engine 3 pack. "Great engine for its size"
My favorite engine in this size - launches small to mid sized rockets really well with great altitude. This is my go to engine for all my single stage rockets up to 2 diameter x 30 tall. This engine will send a small rocket out of sight in a hurry. WARNING: Model rocket motors are flammable. Please use caution. Must be 14 to purchase in CA and NJ. Soak in water to destroy.